The Clansman is a compact, cost-effective hot water boiler, built to Cochran’s famous high standards. 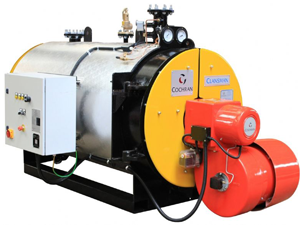 The Clansman features Cochran’s low NOx, low noise combustion equipment as standard. The full wet back system delivers maximum efficiency; combined with a compact design and small boiler footprint; the Clansman is ideal for a wide range of commercial and light industrial heating applications such as hospitals, hotels and small to medium sized manufacturing sites. Rating: 293 kW to 3516 kW (1.0×106 BTU/hr to 12×106 BTU/hr). Standard Working Pressures: 4.5 Bar, with designs available up to 9.3 Bar.